Clark Net’s PCB Assembly solution is an electronic manufacturing services company that offers a vast array of services from PCB assembly (using both surface mount and through-hole technologies) to complete box build and post manufacturing services. They combine state-of-the-art manufacturing equipment along with a highly qualified team of dedicated employees to produce superior products. Our PCB Assembly solution delivers world class electronic manufacturing services to small and mid-size OEMs. Their factory has been providing electronic manufacturing services since 1982 while keeping up with the latest technologies. They continue to invest in state-of-the-art equipment and ongoing skill-building and training of their employees. Their management team is comprised of industry veterans with all levels of experience. From small start-ups to senior levels of management at companies such as Plexus, Tektronix, Tyco, and Intel, our highly respected principal has the background and capability to bring world class electronic manufacturing services to OEMs with low to medium volume projects. Very small to large production runs are no problem! Flexibility and responsiveness are the key strengths that set them apart from other contract manufacturers. Clark Net’s PCB Assembly solution is focused on exceeding the needs of its customers. Our solution has the capability to handle both leaded and lead-free applications for RoHS compliance. 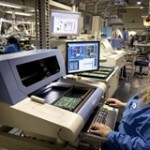 They employ five state-of-the-art SMT lines, and their equipment will place the latest BGA packages. They have been placing 0201 package size components for many years and have the capability to place 01005 package sizes as well. They feature Dek and Ekra screen printers, Philips pick & place machines, and Conceptronic convection ovens. Special processes include components mounted on flex circuits, stacked components down to 0402, and BGA mounting on top of another BGA. A large number of SMT component feeders allow them to have several jobs set up at one time for outstanding flexibility. Their equipment includes an advanced feeder exchange system (FES) which allows for quick set-ups and efficient changeover of jobs. An automated optical inspection system (AOI) is used on SMT assemblies assuring accurate placement of all SMT components. Their quality system meets the requirements of ISO 9001:2008, AS9100C, and ISO 13485:2003, and they are also ITAR certified. Test and rework equipment inventory includes Flying Probe, a Nordson DAGE 5-Axis X-Ray machine, a Metcal programmable BGA/CSProduct VerificationP rework station, and BGA re-balling capability. Each of our PCB Assembly customers is assigned an experienced manufacturing engineer who works closely with them to assure that both existing product and new product requirements are met. Good documentation is one of the most important aspects of electronic assembly and they put extra effort into providing their production group with all the information needed for each product in a detailed and controlled assembly instruction book. Their assembly documents are the result of the combined efforts of their Engineering, Quality, and Production groups. They develop custom assembly instruction documents for every assembly they build. Our PCB Assembly solution’s engineering team can also assist you with Design for Manufacturability (DFM) issues to help lower overall costs and increase manufacturing efficiencies, throughput, and first-pass yields. DFM is an important concept that, if properly understood, will help minimize costs and maintain quality. They are available to provide DFM feedback while a product is still in the design stage to help avoid possible manufacturing issues prior to a prototype run. Please feel free to contact Clark Net regarding our PCB Assembly solution’s DFM services and how they may be able to assist you with a review of board level design considerations to help enhance the manufacturability of your product. Their goal is to provide a resource of collected knowledge available to our customers at every stage of printed circuit assembly development and production. Clark Net’s PCB Assembly solution is certified as a Woman Owned Small Business (WOSB) and supports veterans by partnering with the Department of Veterans’ Affairs to provide employment for veterans who have recovered from service-related disabilities.